While the Masterpieces previously developed alongside manual winding mechanisms, last year saw them adopt automatic calibers for the first time. In 2012, the collection continues to expand, revisiting its long-standing manual expertise with a new version of the incredible Masterpiece Roue Carrée Seconde. 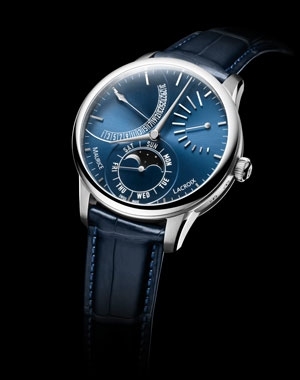 Meanwhile, the new Masterpiece Lune Retrograde further enhances the range with a new self-winding anufacture movement that subscribes to the highest standards of traditional mechanical watchmaking. The modernist design reflects the quest for innovation encapsulated by the brand's "Never Stop Moving" advertising campaign launched last year. While the notion of movement is always at the heart of each timepiece, each design is also driven by innovation. In this collection, time is a form of expression that is never compromised. DECORATION: Vertical brushed and Grand Colimaçon, rhodium coated.